The Texas Stars opened their preseason in San Antonio on Friday night with a 2-0 win against the Rampage. Forward Elgin Pearce, formerly of the Manitoba Moose, ended scoreless play in the third period with a goal from the slot. Winger Nick Caamano pitched in with a late power play tally to put the game away. Philippe Desrosiers got the starting nod in net and answered with a 28 save shutout in kind. 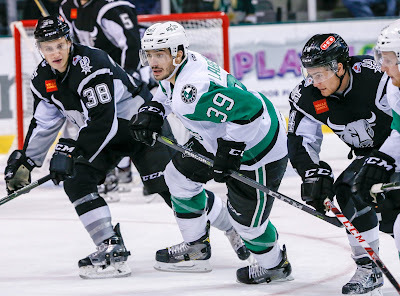 Though it is preseason, the effort was no small feat as the Stars spent ample time on the penalty kill in the first two periods. One of those instances had the Stars facing a 5-on-3 situation. As far as making a case to stick around with the AHL club, Desrosiers did his part. It's up to Colton Point to match him in the crease during Saturday's tilt in Cedar Park. Both teams killed several penalties throughout the duration of the contest. Rampage forward Jordan Nolan served a double minor for roughing in the third period. Tony Calderone attempted a penalty shot early in the second period but came up blank. In other news, defensemen Dillon Heatherington and Reece Scarlett have officially cleared waivers and have been assigned to Texas. They will likely suit up in the final game of the Stars' preseason on Saturday at 5 PM.